(i) The three / two free chances referred to above are not for EACH POST but for ANY THREE / TWO APPLICATIONS ONLY. The claim for exemption from payment of examination fee made in any application which has been rejected / admitted or withdrawn will be counted as free chance availed. (ii) Failure to pay the prescribed examination fee along with the application in-time, will be liable for rejection of application. (iii) The number of free chances availed by the applicant means, the total number of free chances hitherto availed by the applicant in his/her earlier applications submitted to the Commission for any post/recruitment. 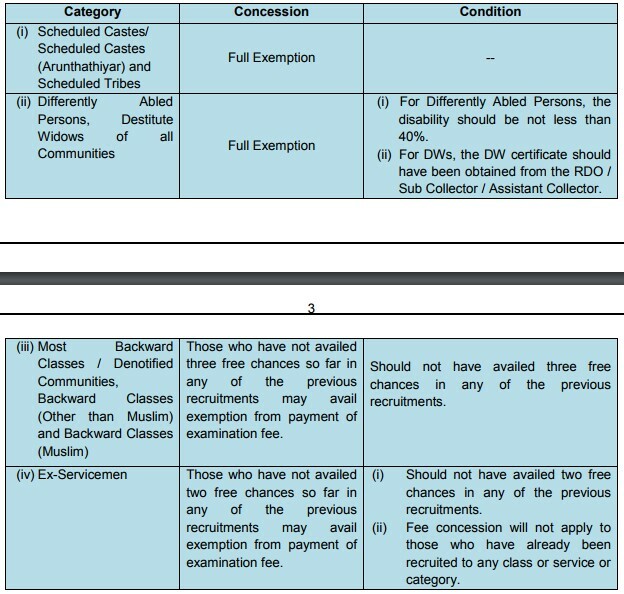 (iv) If, the examination fee concession claimed in the application is found to exceed the admissible limits as announced above, the application will be rejected at any stage of selection. The number of free chances availed by the applicants will be counted from all previous applications submitted through One Time Registration and / or submitted directly without One Time Registration.